Physicists would benefit from studying Moral Philosophy and History as part of their degree courses, according to a leading scientist who became a Catholic priest. Contemporary university practice of separating the Sciences from the Humanities was failing to equip scientists with vital insights into the human condition and the natural world, said Fr Andrew Pinsent during a lecture in Shrewsbury Cathedral. “It is a big problem within all of our educational establishments,” said Fr Pinsent. “We divide studying the Sciences and the Humanities. “If I was studying Physics today, afresh, I would also study Moral Philosophy and History and I would be a better physicist for it,” he added. Fr Pinsent was formerly a particle physicist on the DELPHI experiment at CERN, but left when he discerned a vocation to the priesthood, and went on to obtain degrees in Philosophy and Theology and a second doctorate in Philosophy. He now serves as research director of the Ian Ramsey Centre for Science and Religion at the University of Oxford. The priest became starkly aware in the deficiency in the training of scientists after he was ordained. He said: “One of the major problems today is that people trained in the sciences don’t study Philosophy, Theology and History. “I found this on the way back to CERN a few years ago and I spoke to the director general and some senior scientists. “We all had a discussion about what is truth. They had never thought of that question but we all had a discussion about what it truth that lasted half a day. During the course of his lecture, called “Darwin and the Invisible Gardener”, given during Darwin Week in Shrewsbury, Fr Pinsent pointed out that many of the greatest scientists were religious. They included Gregor Mendel, a 19th century Augustinian Friar from Silesia, now the Czech Republic, who is considered the founding father of Genetics, and Mgr Georges Lemaître, a 20th century Belgian priest and the first person to propose the “Big Bang Theory” to explain how the universe was created. “There are lots of things we can draw from the natural world about how to inform our theological understanding,” said Fr Pinsent, adding that the term “consubstantial” was borrowed from the biological philosophy of the ancient Greeks. “But it also works the other way,” he said. “Theology has given us a certain world view that has proved fruitful in looking at the world. This is not uniquely Christian but it is almost Judaeo-Christian. “One thing that Richard Dawkins (the atheist author) finds very surprising is how many Jewish people have won Nobel Prizes – about 180 … they keep on pouring out these Nobel Prizes in Science and Medicine. It is remarkable. 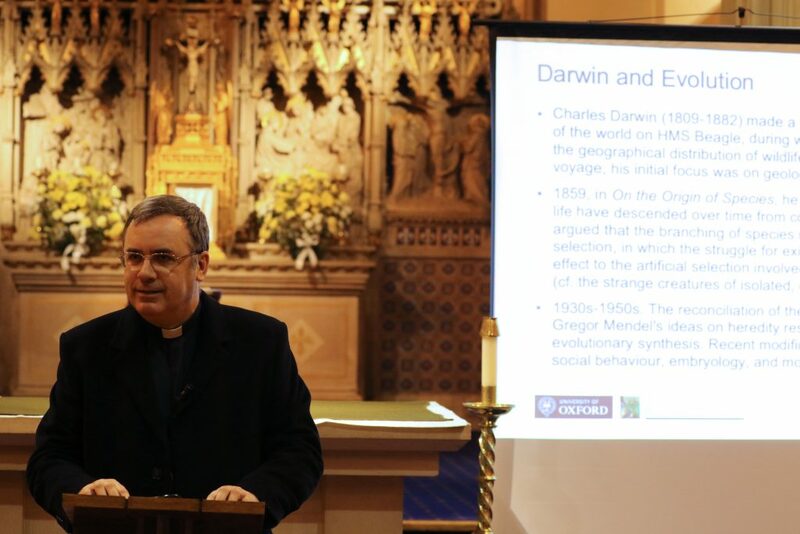 Fr Pinsent noted that Charles Darwin, who was born in Shrewsbury in 1809, was an agnostic rather than an atheist and said that some of his ideas have been misinterpreted. “Christian ethics will differ from a certain spin put on Darwinism in the early 20th century,” said Fr Pinsent. “Some people looked at evolutionary theory and said you must behave as if life is a competition, just the survival of the fittest, and we see these ideas permeating into some of the evil movements of the early 20th century. “As Christians we are called to look for the flourishing of the human person, not just the propagation of the species.